Summary: Overfat is more dangerous than overweight. Body fat, rather than body weight is a better predictor of health. It is therefore important to have an idea of one’s body mass index as well as considering whether one has a disease that would be better under control with weight loss. There are several factors that one should look for if one decides to lose weight in conjunction with a weight loss program. Setting realistic goals and using trained professionals is very important to being successful. The body mass index is very important in deciding if your weight is a problem . To calculate it, multiply your weight in pounds by .045. Multiply your height in inches by 0.0254. Square your answer from step 2. Divide your answer from step l by the answer from step 3. Example: 0.45 x l45 lbs =65. Your height, 5ft., 6″ = 66 inches x 0.0254 = l.68. l.68 x l.68=2.82. 65 divided by 2.82=23. Given this example, your BMI is 23. Consult a table, easily found on the Internet to see where your BMI falls on the scale for obesity. If this is confusing, a fitness center or your physician can calculate your BMI for you. You also need to measure your waist. Find the highest point on your hipbone and measure around your waist just above those points. For women, a waist measurement of more than 35 inches indicates excess fat in the abdomen. This means higher health risks. For men, the number is 40 inches. Now, consider the full picture. Is your body mass index outside of the healthy range? Is your waist measurement too high? Where you carry excess weight can affect your risk of health problems. Do you have a health condition that would improve most likely, if you lost weight? Some of these conditions include high blood pressure, diabetes, high cholesterol, and high triglycerides, as well as osteoarthritis. 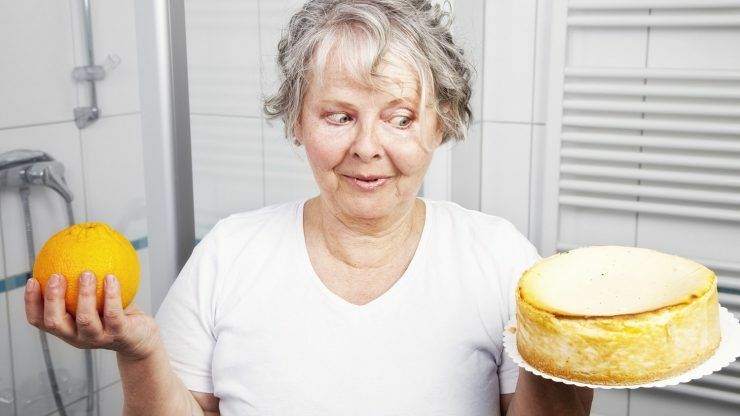 Further, are you at risk for problems later in life if you don’t slim down? Do any of your family members have any of the before mentioned diseases? A family history of any of these diseases makes you more prone to developing one of them. These are some of the diseases that are chronic and weight related. Last, do you overeat, smoke, or drink daily? Do you live with uncontrolled stress? If you overeat, you may be eating too much fat. Smoking causes lung and heart disease. Excess alcohol impairs the liver and can impair nutritional balance. Too much negative stress eats away at physical and emotional health. If you combine all these behaviors with carrying too much weight, there may be greater health implications. If you answered “no” to the above questions, your weight is probably fine. If you have questions, consult your physician. If you answered “yes” to any of the above questions, shedding some weight may well improve your health. What Might Work? Make a commitment to making some lifestyle changes. Think about all the good that will come of losing weight. Get your priorities straight. If your life is not in order, losing weight is more difficult. Therefore, if you have financial or marital problems, or are unhappy about another aspect of your life, work on that first. Set realistic goals for weight loss. To lose weight and keep it off, it is important to lose pounds slowly and steadily. This usually means losing one to two pounds weekly. Set weekly or monthly goals so that you can track your success. If you have always been overweight, it may be more realistic to measure your weight as related to when your blood pressure or blood chemistry improves. Learn to eat healthier foods. Diets based on lots of green leafy vegetables, fruits, and whole-grains are the healthiest. Also, eating green leafy vegetables has the advantage of actually burning calories during digestion thus aiding weight loss. If you crave sugar, eating just a little after consuming fiber such as broccoli or spinach, slows down the digestion of the sugar so it is not as detrimental to the weight loss. Cutting back on calories is easier if you focus on limiting fat to less than thirty percent of your daily calories and using portion control as well. You can eat more foods that are rich in the proper nutrients for fewer calories and less fat. It is very very important when losing weight to get and stay active. Cutting 250 calories from your every day diet can help you lose about a half a pound a week but if you add a thirty minute brisk walk for four days a week you can almost double your weight loss. It is still a benefit if you break your exercise periods into several short sessions such as ten minutes three times a day. When changing your lifestyle habits, look at HOW you eat. Were you taught to clean your plate? Learn to leave a little food. Do you eat too fast? It takes thirty minutes for the brain to register that the stomach is full. Learn to eat slowly and chew everything ten times. Look at When you eat–in front of T.V.? Do you eat all the time? Look at your shopping habits and the way you cook. Do you eat fast food? Do you buy high-fat food or foods that contain a lot of sugar? Learn to avoid buying foods that are bad for your weight loss. Many many Americans enroll in some kind of structured weight-loss program each year. Before considering one be sure it meets the following criteria: It must be safe. That means, it must provide adequate nutrition.Low in calories does not mean nutrition poor. There should be reasonable weight-change goals. There may be some people with physical conditions that require rapid weight loss. A physician should be in charge of these. The majority of people need to lose weight slowly and steadily. Rapid weight loss, especially in the first week or two is mainly loss of fluid. Generally speaking, a goal of losing one to two pounds a week toward an initial goal of ten percent of your weight is considered by most doctors to be reasonable. Physician participation is very important. Don’t participate in any weight loss program without your doctor’s permission. Reputable weight loss programs require this. Also, any good program gives you help in maintaining your new weight. This means changing your eating habits and having an exercise program that is ongoing. There should be upfront information about fees. Fees quoted should include the cost of the program, dietary supplements if there are any, and any other products you will need. In summary, make a healthier lifestyle, not the pounds lost your destination.